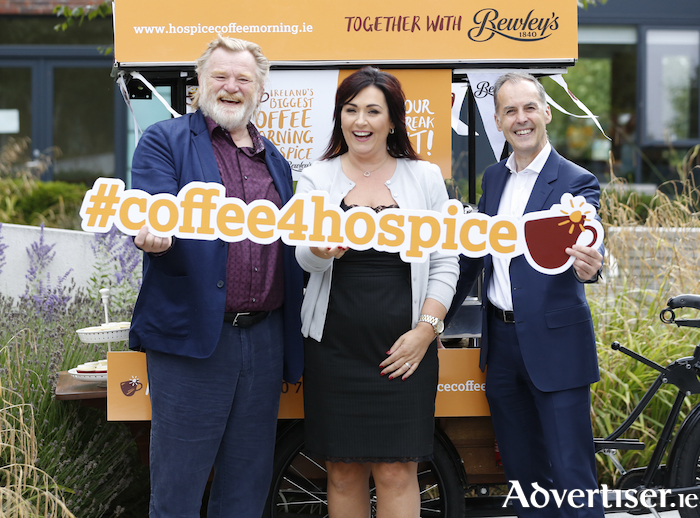 Pictured at the launch of coffee4hospice at St Francis Hospice, Dublin were Brendan Gleeson, Martina Jennings (CEO Mayo Roscommon Hospice) and John Cahill (CEO Bewley’s). Be part of Ireland’s largest Coffee Morning on September 20 and support your local Hospice. To order your free pack of coffee please call (094) 9388666. Irelands largest coffee morning for Hospice is set to make a welcome return this month as thousands of people across the nation come together to support their local Hospice on Thursday September 20, by hosting coffee mornings in their homes, workplace and within their local community. The national coffee morning for Hospice is a vital event in the annual fundraising calendar for Mayo-Roscommon Hospice and this marks the 25th year that the foundation will have participated in the coffee morning. Over the years, the coffee morning for Hospice has grown from strength to strength and has become hugely popular for members of the public who wish to support Palliative Care Services by giving something back. Mayo Roscommon Hospice is appealing for individuals, active age/ladies groups, schools and organisations to host a coffee morning/evening on their behalf on this date. Martina Jennings, CEO Mayo Roscommon Hospice stated: "We find that our coffee morning hosts range from families who have availed of the service and experienced the work of our wonderful palliative care teams first hand, right through to neighbours and work colleagues of the patient and the family, who have heard of what we do. "The coffee morning is a really enjoyable social event for those who wish to host one and indeed for all those who attend. So we are really hopeful that on our 25th year of running this event, it will be our largest coffee morning ever. "This year has been a particularly busy year for us as we make great headway on the build of our 14 bed state of the art Mayo Hospice in Castlebar, which is due for completion in Spring 2019. We have also started the planning application for our eight bed Hospice in Roscommon, which we hope to have opened by January 2021. "We are just so grateful to the people of our two counties who tirelessly support our Foundation year after year. Without the help of the public and their generosity in raising much needed funds, we would not be able to have undertaken the financial cost to build these much needed facilities in Mayo and Roscommon. "The combined cost for the build has been projected at €15 million and thanks to the generosity of Bewleys, it means that every single euro raised by people who host a local coffee morning, goes directly towards the capital development building fund. "Additionally, Mayo Roscommon Hospice also fund the palliative home care service across the two counties. This costs the Foundation €2.2 million annually and as the demand for this much needed free service increases, so too does the running costs for the foundation"